Get ready for the summer festival season with our light up piercing jewellery. Light up jewellery is the perfect way to stand out, whether you’re going to a festival, clubbing or just looking for a brand new look. 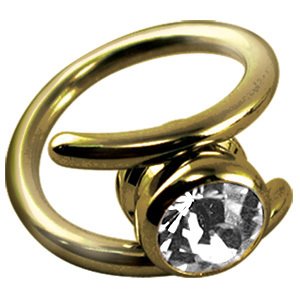 This piercing jewellery is easy to wear with any outfit. We have a great choice of light up jewellery, from glowing belly bars to glow in the dark tunnels. Our light up navel bars make a big impact wherever you go. As you can see, these bananabells feature a light up glow stick through the middle of a UV bananabell. They come in a pack with extra glow sticks, so they can be used again and again. These bananabells are the perfect way to show off your navel piercing, especially for clubbing and summer festivals. CZ studs are a style classic but these light up CZ earrings go one step further! They light up and flash, so they really get everyone’s attention. 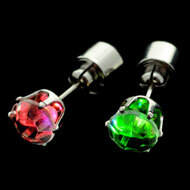 These light up earrings come in six different colours, including a multicoloured pair. This entry was posted in Ear Studs and Earrings, Navel Bananabells and tagged clubbing body jewellery, glow in the dark accessories, glow in the dark body jewellery, Glow in the Dark Jewellery, Glow Piercing Jewellery on May 11, 2012 by Piercing Guru. If you really want to stand out then a great way of doing so is by wearing glow body jewellery, this enables you to rock out, rave or simply make a bold fashion statement. Wearing glow body jewellery makes it easier for your friends to find you in large venues too, UV light is required for full effect UV lenses but it also looks great under artificial light without the glow effect. Another option to UV Glow Body Jewellery is glow in the dark body jewellery, you can wear this in any dark space to enjoy a brilliant glow. Glow Body Jewellery comes in a variety of colours including purple, orange, blue, pink, green and clear, with titanium and glow threaded balls also available. 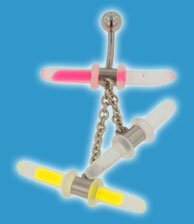 For those with tongue piercings, the silicone glow body jewellery such as the ticklers look awesome in UV light, each time you open your mouth. A great feature of glow body jewellery is that the material it is made from is flexible, this is perfect for sensitive piercings and tongue bars, allowing you to enjoy increased comfort as the jewellery bends to the contours of your body. A great way to brighten your look is by wearing this stylish Blue Flexible Glow In The Dark Bananabell, you can enjoy the gleaming blue glow in the dark effect without the need for UV light, so can glow wherever you are. 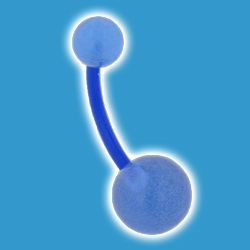 The blue flexible glow in the dark bananabell is made from flexible material and is metal free so will not irritate piercings. You can even keep the blue flexible glow in the dark bananabells in for hospital visits and naval piercings can keep these in during pregnancy. This entry was posted in Adult Body Jewellery, Belly (Navel) Piercings, Fashion Accessories, Festive Body Jewellery, Glow Body Jewellery, Jewellery Materials, Silicone Body Jewellery, Titanium Body Jewellery, Tongue Piercings, Types of Jewellery, UV Body Jewellery and tagged Bananabells, Belly Button Bars, Body Jewellery, glow in the dark body jewellery on July 18, 2010 by Piercing Guru. Turn heads and make a fashion forward statement with our chic selection of glow piercing jewellery. The warmer seasons have finally arrived; this is a great opportunity for you to show of your body piercings. Our glow body jewellery range will make you stand out of the crowd. The retro colours are designed to gleam in the dark; this is great for clubbing, festivals and if you simply want a brand new look! 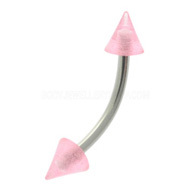 Make a statement with our chic glow piercing barbells. This funky jewellery adds a shot of vibrant tones to your look, it really brightens up your outfit. Our cute flexible barbells features glow balls that have a sweet two tone look, they glow in the dark and are UV reactive, this barbell really makes a statement! This entry was posted in Balls and Accessories, Glow Body Jewellery, UV Body Jewellery and tagged Glow Body Jewellery, glow in the dark body jewellery, Glow in the Dark Jewellery, Glowing Piercing, Ultra Violet Jewellery on June 11, 2010 by Piercing Guru. Clubbing body jewelry is a great way to stand out and adds something special to your regular clubbing look. Most clubbing body jewelry is designed to glow or light up in the dark, creating a bold look and hypnotic shapes on the dancefloor. 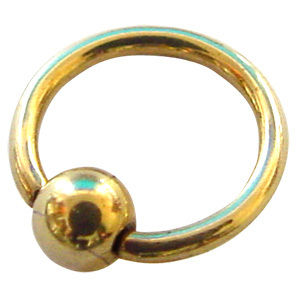 You can find clubbing body jewelry in lots of different types, including belly bars, barbells, studs and ball closure rings. 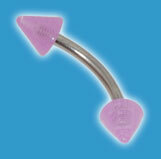 If you want to hang onto your current piercing jewelry the best option is UV Threaded Accessories. These UV-reactive balls and accessories screw onto your jewelry and allow you to transform your look for a big night out. Ultra violet body jewelry is made from UV-reactive materials such as PMMA acrylic and UV glass. It looks normal in the daytime but glows brightly when exposed to UV light or blacklight â€“ perfect for raves and clubs. Most clubs use UV light and once you walk under it these fab pieces of clubbing body jewelry will start to glow. The pieces below are all made from UV-reactive PMMA acrylic which has the added advantage of being very lightweight, cheap, durable and comfy to wear. This entry was posted in Glow Body Jewellery, UV Body Jewellery and tagged clubbing, glow, Glow Body Jewellery, glow in the dark body jewellery, Glow in the Dark Jewellery, Glow Jewellery, Glow Piercings, Glowing Jewellery, Glowing Piercing, uv, UV Body Jewellery, UV Body Piercing, UV Jewellery on May 7, 2010 by Piercing Guru. Glow body jewellery comes in an infinite choice of bright and funky colours, materials and psychadelic designs to brighten up your day! Glow body jewellery is brilliant for clubbing, festivals, parties and make gorgeous glowingÂ gifts all year round. Glow body jewellery includes glow in the dark body jewellery and UV Glow body jewellery that glows fluorescently under Ultra Violet light. Titanium glowingÂ body jewellery can be used to customize your look within seconds, whilst these glow tongue ticklers are great for tongue piercings! We have a very unique range of glow body jewellery that glows in the dark, with a huge selection to suit your every need. Glow in the dark body jewellery includes glow in the dark barbells, glow in the dark flesh plugs, glow in the dark curved barbells, glow in the dark bananabells, glow in the dark threaded accessories, glow in the dark tapers. Glow body jewellery comes in various colours to choose from, the colours are visible in the bright daylight too! Ultra Violet glow body jewellery is fantastically bright and jazzy! With such a spectrum of glowing colours to choose from, the UV glow body jewellery boasts hundreds of different colour combinations and patterns to suit your personal style. UV glow body jewellery includes glow barbells, glow bananabells, glow stretching gear, glow labret studs, glow body spirals, glow ball closure rings, glow curved barbells, glow navel bananabells and much more! These titanium glow body jewellery accessories include threaded glow balls, with glowing UV fluorescent balls and glow in the dark threaded balls. This entry was posted in Ball Closure Rings, Balls and Accessories, Barbells, Belly (Navel) Piercings, Circular Barbells, Eyebrow Piercings, Glow Body Jewellery, Labret Studs, Navel Bananabells, Piercing Accessories, Stretching Jewellery, Tongue Piercings and tagged Glow Body Jewellery, glow in the dark body jewellery, Glow Jewellery, Glow Piercing Jewellery, Glow Piercings, Glowing Jewellery, Glowing Piercing on December 1, 2009 by Piercing Guru. Ensure that nobody misses you or loses you in the crowd, with glow in the dark jewellery. The special glow in the dark material used for glow in the dark jewellery is flexible, this makes it ideal for tongue bars as well as sensitive piercings. Fantastic for lightening your look, glow in the dark jewellery looks absolutely stunning in the light as well as in the dark. You should also check out the UV Body Jewellery, which looks awesome whether you are at a rave or just down the pub garden. Enjoy showing off your piercings with these Flexible UV Barbell Purple & Blue Glow in the Dark Jewellery Glow Balls. Two UV barbells come with two detachable two-tone balls which glow in dark too and the cool purple stem is UV reactive, awesome for clubbing. The UV barbell stem is nice and flexible and biocompatible, you can even wear this glow in the dark jewellery during X-rays. 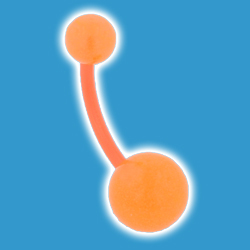 These vibrant Glow in the Dark Barbells also come in Blue, Green, Orange and Clear. 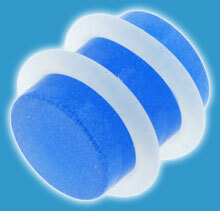 Complete your look and stun the people around you with this bright blue flesh plug glow in the dark jewellery. You can wear these glow in the dark glow plugs for general nights out, partying, raving or pretty much where you please, adding some funky style into your night. These glow in the dark flesh plugs and tapers also come in Green and Clear. Use this pretty purple eyebrow bananabell glow in the dark jewellery to lighten up your style, made from 316L Surgical Stainless Steel, the eyebrow bananabell threaded cones stand out to make you look incredibly fashionable. This entry was posted in Adult Body Jewellery, Fashion Accessories, Types of Jewellery and tagged Body Jewellery, glow in the dark body jewellery, Glow in the Dark Jewellery on October 22, 2009 by Piercing Guru.